Oppo PM-3 review | What Hi-Fi? They say you should never judge a book by its cover, but we can’t help being excited – the Oppo PM-3 headphones are a sight to behold. Titanium arms, leather ear-cups, and gorgeous milled hinges – what’s not to like? The visual appeal of these headphones is instantly evident. 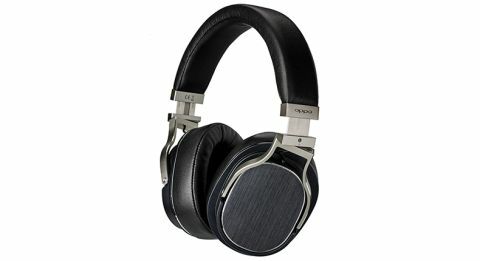 Sitting at the foot of the Oppo headphone range, the PM-3s share the same planar magnetic driver as their more expensive PM-1 and PM-2 siblings. The driver has a diaphragm printed with a conductor and held between two magnets. The magnetic field generated as the music signal passes through the conductor reacts to the field generated by the magnets, causing the diaphragm to move. The idea is to offer greater accuracy and minimise distortion. Weighing in at 320g, the PM-3s are by no means the lightest (compared with the 290g Bowers & Wilkins P7s, for example) but we never find the weight an issue. The fit is reassuringly firm and comfortable, although they can cause your ears to heat up with extended listening. The PM-3s are supplied with a robust denim pouch, which implies they will be used outside, but we’d take care with venturing out with these – you wouldn’t want to get caught in the rain with them. Along with the pouch the headphones are supplied with three cables. These cover use with Android and Apple devices, plus listening at home. The domestic cable is a useful 311cm long – perfect for watching that film at full blast while the rest of the household is asleep. The PM3s are an engaging listen – it’s all too easy to lose a couple of hours as the Oppos seduce you with a delivery that’s both layered and insightful. Tonal edges are smooth and rounded, a trait that becomes apparent when we listen to The Day The World Went Away by Nine Inch Nails. A lesser pair of headphones would have made a mess of this track, but the PM-3s deftly render the penetrating bass and deliver a coherent whole without fuss. The emotion in Trent Reznor’s vocals is equally well served. It’s a testament to the PM-3s’ skill with organising disparate strands. Herbert von Karajan’s wonderful recording of Beethoven's 7th Symphony with the Berlin Philharmonic confirms the PM-3s’ rich tonality as well as their talent for detail. Nevertheless, that smooth character rather takes the edge off the strings, which sound underplayed and subdued as a result. Do we recommend the Oppos? For looks and build quality, it’s a definite yes. Then there’s the insightful presentation and punchy, controlled bass. But higher up the frequency range, these headphones lack the sonic finesse of rivals. They are well worth a listen though.